Reviewed and edited by Renee Amiro and Dr. David Lewis. Its early afternoon during your ortho call shift and you get a call from emerge staff saying that they have two patients coming with potentially significant injuries when a piece of equipment rolled over during transport. EMS has informed them that one has a broken ankle. When you arrive to the ED he tells you they are just getting the patient’s pain under control and ordering x-rays. You head to the room to see the patient, a large burly 35 y/o with an obviously deformed R ankle. His exam is otherwise unremarkable at this time, he has good cap refill to the toes, sensation to the web space, dorsum/plantar and medial/lateral surfaces of the foot is intact and he is able to move his toes. On palpation his lower leg compartments are firm but not hard. 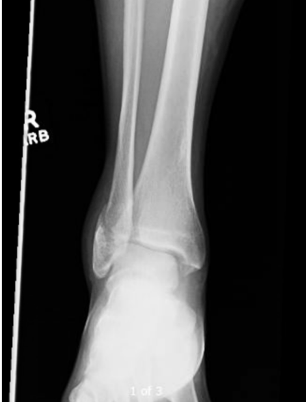 An x-ray is done at bedside and shows a Weber Type B fracture of the fibula. His pain seems to be increasing as you speak with him and he has no significant past medical history. He tells you he was loading a piece of equipment when it got away from them and rolled over his leg pinning him momentarily, so he was hanging off a piece of equipment by the leg. Your exam is limited by pain and you ask the nurse if she can give the patient some more pain medication and you’ll return as soon as you see the other patient. -Muscle compartments are bound by bone or fascia, two restrictive tissues that create a relatively fixed volume compartment with a very limited ability to compensate for any increase in fluid volume. -When a traumatic or pathological process results in increased fluid within a muscle compartment the pressure within the compartment increases. This increase in pressure results in reduced arteriovenous pressure gradient (reduced arterial pressure and increased venous pressure) that impairs tissue perfusion within the compartment. As the pressure rises within the compartment capillary flow declines resulting in an enhanced local blood vessel permeability which further increases compartment pressures. If pressures continue to rise tissue ischemia and necrosis will develop. Compartment syndrome is a true orthopedic emergency and early recognition of its clinical signs is critical in preventing irreversible tissue damage, rhabdomyolysis, and limb loss. Severe pain out of proportion to the examination and pain with passive stretching are the first symptoms of ACS to occur. While the early signs are 97% specific for ACS they are only 19% sensitive in the absence of other findings. The combination of pain with passive stretch, paresthesia, and pain with rest has been reported to be 93% sensitive and if paresis is present the sensitivity increases to 98%1. Unfortunately, paraesthesia and paresis are late findings of ACS and delaying the diagnosis until they are present can result in unacceptable delays in treatment. Once a motor nerve deficit has occurred patients will rarely recover function after fasciotomy. Normal compartment pressures are between 8 and 10mmHg in adults and 10-15mmHg in children. 30mmHg is diagnostic for compartment syndrome and should prompt an orthopedic referral when combined with clinical symptoms of compartment syndrome. An alternative is to calculate a differential compartment pressure for an individual patient as factors such as hypertension, peripheral vascular disease and patient medication can cause a large variance in individuals compartment pressures. Differential compartment pressure is calculated by the diastolic blood pressure minus the intra-compartmental pressure if this is under 20mHg then fasciotomy is indicated. If the patient is alert and able to elevate the affected limb, serial examinations over a two-hour period may prevent unnecessary fasciotomies. This should be done in consultation with your orthopedic colleagues. Devise: dedicated compartment manometer (Stryker Intra-Compartmental Pressure Monitor) or by using IV tubing and an ART line transducer attached to a long needle. Who is most at risk of developing compartment syndrome? Fractures represent 70% of all cases5. 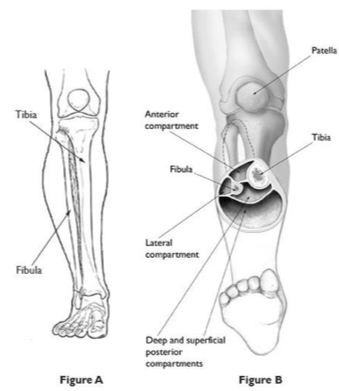 Fractures of the tibial diaphysis account for 40% of all cases in North America. Apply ice to the affected limb if the compartment syndrome is secondary to trauma. Definitive treatment is a surgical fasciotomy. You return to see the patient and nursing staff tell you they are unable to get the patients pain under control despite significant amounts of narcotics. The examination of the lower leg is repeated and the compartments of the leg feel the same however the patient is unable to move his toe. He reports significant pain on passive flexion and extension of the great toe. 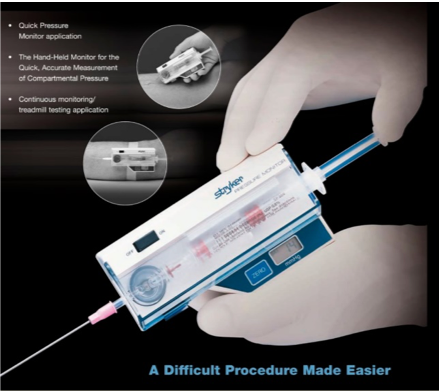 You call your staff to inform her of the change in the patient and that you are concerned about compartment syndrome and she requests compartment pressure measurements using the Stryker Kit. The senior resident performs the compartment pressure measurements with you and you record pressures of 14, 14 and 25mmHg. 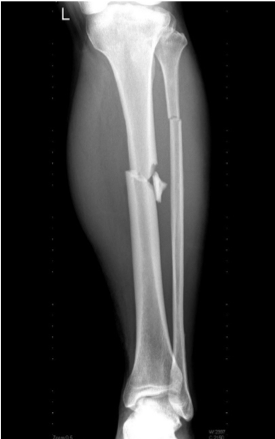 The patient had significant leg pain on discharge and subsequently presented to the ED on POD#7 for significant leg swelling. Ultrasound was performed to rule out DVT and the patient was discharged for follow up in clinic. He did not go on to develop any further complications. Compartment syndrome is an important not to miss diagnosis. It should be considered in any hard to control limb pain, especially when associated with fracture. McQueen, M. M., & Court-Brown, C. M. (1996). 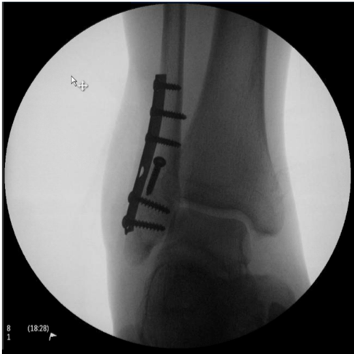 Compartment monitoring in tibial fractures. The pressure threshold for decompression. The Journal of Bone and Joint Surgery. British Volume, 78(1), 99–104.